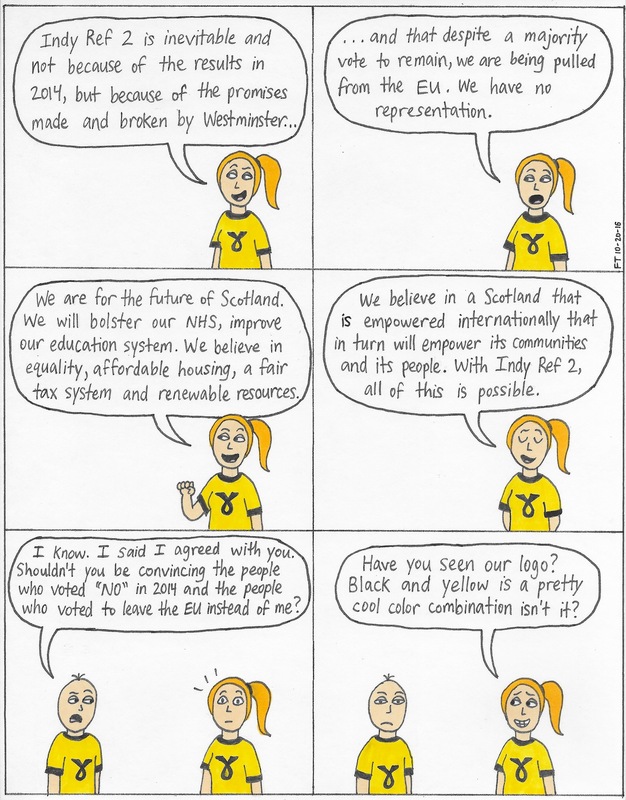 This entry was posted in Uncategorized and tagged #bothropsasper, #brexit, #FT, #indyref2, #politics, #Scotland, #snp, #twitter, #u, #UK, #webcomic. Bookmark the permalink. To be fair, it’s only because we’re too polite to block her. She is followed because the threats received if we decline are so Machiavellian in nature that we have little choice. Not to say we haven’t accrued a little affection (between all of us) for the wee nutter. We are, in short, a free distribution service for her nonsense – coerced into forced labour and kept in line by an unfathomable points system which, if queried, loses you points. The final outcome seems to be that there are no winners here (apart from FT). Her Da is just as bad. 🙂 – Aye, an’ the jaiket an’ breeks. That’s how she raids the food banks wi’oot bein’ caught.